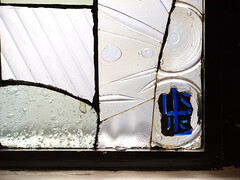 The continuing saga of our quest to photograph and document the stained glass windows of Lawrence Lee (LSL). I was going up to London to meet some friends, one of whom was over from Paris, and Stephen and I thought it would be a good idea to visit some of his father’s windows while I was there. Stephen was to be at his family’s home in Hastings and said that he would be able to get into London – Piccadilly – to meet me by 10.30. 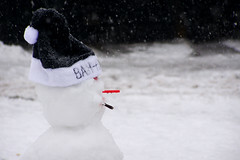 However, as the date neared, his family’s plans changed and he would no longer be visiting them. No problem, he would travel to London from the Isle of Wight. I suggested that we meet a little later than planned – after a little discussion we settled on 10.45 instead. Apparently it would have been more difficult to get out of the small town near Hastings early in the morning, than to get off the Isle of Wight. I take back everything I have ever said about the place. Well almost. Back in the middle of February we had been contacted, via the Flickr site we have set up for the Lawrence Lee project, by David Allen of the Royal Society of Chemistry who is in the process of compiling a booklet on the society’s historical collection. He was looking for more information on the windows. We decided we had to visit. So we met at Piccadilly at 10.45 – almost bumping into one another in the street as we both tried to locate Fortnum & Mason which I had thought was on the main street, but which is tucked behind – and headed to Burlington House where we walked past the huge queue for the Van Gogh exhibition to find the society in the corner of the courtyard. We were both bowled over by the windows (click the image left to see the other) and the glorious sunlight flooding through the first one on the lower landing made it all the more stunning. Unfortunately we were unable to tell David anything new about the windows as all we had from LSL’s collection were a couple of slides. Stephen will ask his father about the designs when he next sees him, although he may not remember the concept behind them. David said that none of the chemists thought that there was anything particularly related to chemistry in the windows, but we all agreed that there was a certain biological and cellular look about them, and also perhaps an astronomical aspect. We also found favourite themes – Fire, Earth, Air and Water, the four elements – which often appear in LSL’s work. The pieces of glass are of many varieties – some being like that of patterned ‘bathroom window glass’ and the whole is held together with cement. Stephen was concerned that there appeared to be no cement between some of the pieces of glass so we took a trip through the corridors of the building to be able to view the higher window from the outside. This confirmed that the glass pieces were stuck onto plain glass. Stephen commented that the adhesive would normally cloud over time, but these 1968 windows showed no sign of any deterioration. We grabbed a quick coffee and some cake before getting onto the tube (no imitation Sean Connery satnav this time) and heading off for Southwark and Glaziers’ Hall. 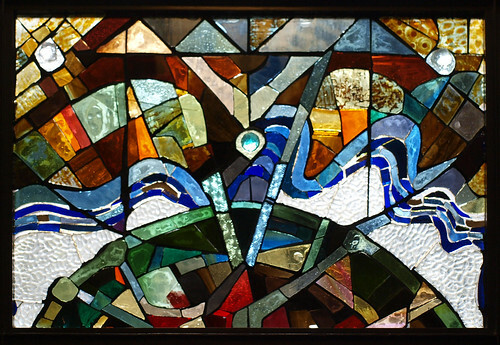 Lawrence Lee was elected Master of the Worshipful Company of Glaziers in 1974 and was instrumental in introducing practicing stained glass artists into the Company at an affordable rate, as most of the members had hitherto been wealthy businessmen. I had been corresponding with the clerk of the company and there had been some confusion about the piece as it is not actually a window but a backlit piece in a hall without windows. Also the slide photograph we had of the work in progress showed a whole lion on the shield whereas this piece has a demi-lion. By the time we visted, Alex Galloway (the clerk) had looked into it more and it seems that this was the piece from the photograph but that LSL had had to revise the lion in order to make the coat of arms accurate. Basically he got the lion wrong first time. This piece is another where the glass has been stuck onto plain glass. What can’t be seen in the image above is the very dark glass surrounding the roundel – the backlighting was not very helpful when it came to photographing the work, although I did manage to knock a lot of the yellow out of it in Photoshop. Tungsten light can be a nightmare. The glass around the outside is all chunky lumps of clear glass (click the image to see more). 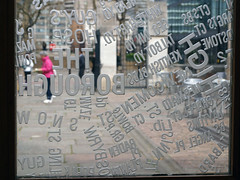 Next it was literally around the corner to Southwark Cathedral where we found two windows. 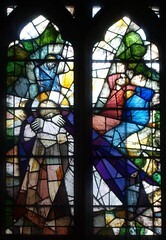 The first, a large window with three main lights, was done in 1959 and depicts the Madonna and Child at the centre, with various religious figures in other roundels. The Holy Spirit (one of LSL’s ubiquitous doves) tops the design. What fascinated me was the detail as usual. 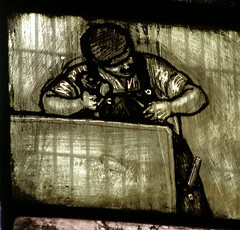 Within this window are a great number of images of craftsmen working. Whether or not they were based on actual people is unclear but some have very clear faces which are not LSL’s usual style of ‘generic’ face. The window is dedicated to Thomas Francis Rider who rebuilt the nave of the cathedral. He died in 1922, long before the window was made. 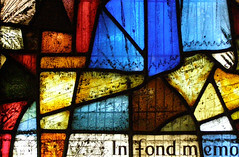 The second, much newer window (1987 – click for detail) is a memorial to Maurits & Maise Mulder Canter. 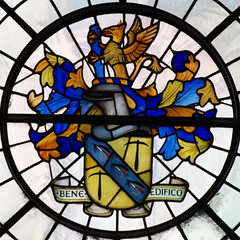 It seems he was a Glazier because the window also depicts the Glaziers’ coat of arms (with the demi-lion) and a figure holding a sheet of glass. Also shown are two glass-blowing instruments and a sketch of a stained glass window. 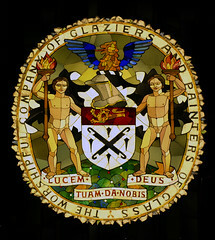 The words “Oh God give us thy light” is the English translation of the Glaziers’ motto – Lucem tuam de nobis Deus. Quite fitting. It was by now time for lunch so we decided to eat at the Cathedral. The food looked wonderful and was quite different from the usual fayre. Quite a variety of foods too. Stephen chose a stuffed pepper and I went for the stuffed aubergine. We had two choices of salad with that – though all were more substantial than what usually passes for ‘salad’, mine being one with cous cous and another with chick peas. The coffee was wonderful. Sadly the aubergine was tough (but its topping was lovely and the salads were more than enough to make it a meal). We paid 30p each to use the toilets – wouldn’t mind but it meant we had to go to the shop to buy tokens to put in the doors, which was a bit of a palaver – and set off for London Bridge. I haven’t walked over London Bridge for many years and it was a lovely day. No sign of the volcanic ash wafting over the us at great height from the Eyjafjallajökull volcano which was stopping all flights to and from the UK. I swear the underground staff were queuing up to make tannoy announcements just so they could say “volcanic ash from Iceland”. It’s not every day you get to do that. We walked up to Throgmorton Avenue by London Wall to visit the Carpenters’ Company where we met their archivist. 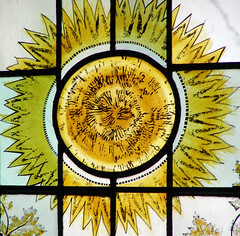 There we saw a very large window with many heraldic shields, connected by a simple Tree of Life design which also incorporated the four elements of Fire, Earth, Air and Water (the sun, opposite, representing Fire). It also includes “symbols of learning and medicine”. The coats of arms in this 1970 window, known as “Bernay’s Memorial Window” are believed to ‘belong’ to the one person. 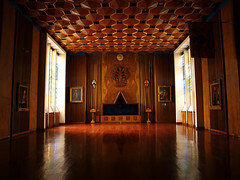 We were also treated to a view of their main hall which is, as you might expect, completely decked out with wood. It’s very dark in there, but the two huge stained glass windows bring a warm light into the room and really make it glow. I can’t remember the exact details but I think we were told that the floor was a couple (or few) hundred years old. These old halls were making a nice change from churches. Often Lawrence Lee would write a little about his windows for the place where they would be installed. Unfortunately this was not always the case – or at least, we are discovering that not all places have the information. Many of his designs require no explanation, but some of the more abstract pieces would be enhanced by a few words from the artist. Here at Carpenters’ Hall there is a key to the window and its elements. Our next stop was the Worshipful Company of Painter-Stainers at Little Trinity Lane. We were greeted by the beadle (I have never met a real beadle before and I love that these designations are preserved) who showed us into a dark hall with an array of heraldic windows along one wall. Lawrence Lee’s windows were at the far end – a group of three – and with some help the curtains were pulled aside to reveal even more heraldry. LSL took quite a few secular commissions and I suppose it was inevitable that coats of arms and the like would be the norm – after all, they appear so frequently in his church windows too. I find them a little dull though. Stephen says they will have put food on the table and you can’t argue with that. Our final call was to be St Lawrence Jewry at Guildhall Yard and we had to dash to get there in time as it was due to close at 4pm. 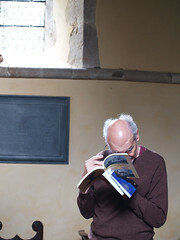 I had contacted Canon David Parrott the previous week to find out if we could visit and by coincidence he was, when he received my mail, about to host a memorial service for the late Sir Charles Alexander, son of Sir Frank Alexander – and one of the windows was to be the centre of attention. 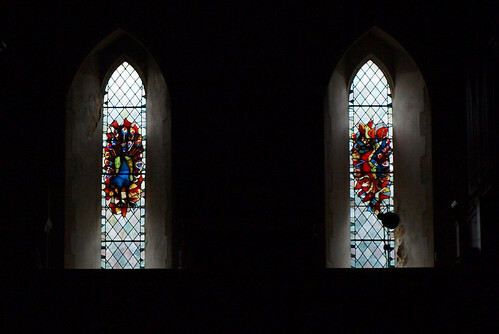 He asked if I might be able to photograph the other windows in the church while I was there, as they do not currently have any good images of them. Of course I was happy to do this and spent some time capturing the huge windows in this lovely Christopher Wren building. Worth a visit if you’re in the area and you can read more here. We did try three more places – St Mary, Abchurch; St Mary, Aldermary; and St Magnus the Martyr – but they were all closed. We have become used to rural churches staying open until sunset. This is not the case in the city but at least here we did not need to find someone two miles down the road who had a church key under a flower pot, except on Wednesdays. I exaggerate. All in all it was a successful day with six sites visited and we are optimistic for the next foray into the area when we will try to complete the set. After a well deserved coffee Stephen and I parted company at the Monument – he returned to the Isle of Wight via Waterloo and I headed north for a quick drink with my friend before going back to hers for the evening. Some of the images link to larger versions of themselves, but others will take you to other views of the same window or to an image of another window in the same building. Always worth clicking through. There are also some links in the text of this piece. 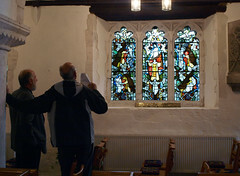 It was only recently, thanks to a list of LSL’s windows shared with us by Peter Hart (who we met at St James, Milton, Hants), we discovered that there was a third church here on the Isle of Wight boasting a “Lawrence Lee”. We had already visited Holy Cross in Binstead some years ago (the two gallery windows there were the first of LSL’s that I’d seen), and we visited All Saints, Ryde back in October last year. The Ryde window is magnificent – depicting all the saints (as you might expect). It’s worth taking a look at the photos (link above). We headed off to Wroxall this morning in the icy cold rain and found a small window at St John’s which, if it had a title, I would be inclined to call The Lamb of God. Stephen and I quickly came to the conclusion that this was not one of LSL’s finest pieces – fairly uninteresting overall, as were the other windows in this particular church. 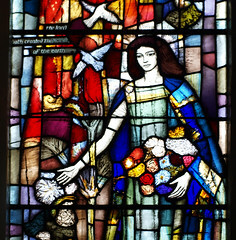 It was done in 1953, so was one of his earlier works (although so was the Ryde window), and it is possible he had a fairly rigid brief as it looked very much in keeping with the others. We found the colours to be a little duller than usual and there was nothing of his usual flair about it. Interestingly the photos make the colours look brighter than they seemed to the eye. Stephen recalled that at times his father was working flat out to fulfill commissions and inevitably some were done ‘to order’ and others allowed him some freedom of expression. His style certainly developed over the years but it is in evidence in some of his earlier windows too. After that we drove back to Ryde and picked up a friend, Jan, and went on to Holy Cross, Binstead to revisit the four windows there. On our first visit Stephen and I had only been aware of the two gallery windows depicting the Peacock and the Phoenix, back in the days when I was using film exclusively. On our second visit we were unable to access the gallery, although our main purpose then was to photograph the Holy Spirit and the Holy Cross windows that had since come to our attention. On that occasion I was using a new digital camera and I had never been pleased with the results. The gallery windows had been installed in 1971 during restoration following a fire in 1969. 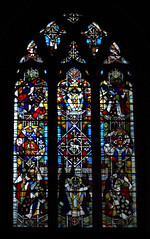 The Holy Cross window is also dated 1971 and the Holy Spirit the following year. We chatted with the lady who kindly opened the gallery for us and she remembered the fire. She told us that it could be seen from the ferry (a member of the clergy was coming to visit and obviously had no idea that the fire he could see was the church he was heading for). This time I was much happier with the photographs – the colours weren’t washed out and the detail was sharper. 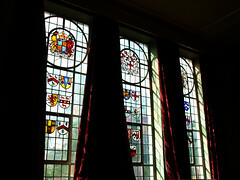 Our next planned visit will be to some windows in London – particularly one at the “Chemical Society”. We haven’t yet decided on which other places we’ll see as it will, as always, involve emails, phonecalls and route planning. We might also pay a return visit (for me at least) to St Marylebone so that Stephen can see the Madonna and Child window there, which I photographed when I was in London back in January. 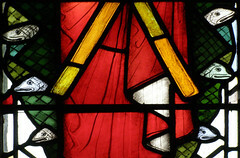 As always, watch this space, and keep an eye on the Lawrence Lee Stained Glass Flickr group for the latest updates. Most of the images link to larger versions of themselves, but some will take you to other views of the same window or to sources of more information. Always worth clicking through. There are also quite a lot of links in the text of this piece. The hotel was right next to the London to Brighton train line, which we could hear in the distance. Urban foxes called out in the gardens below the window, and sirens wailed their (presumably) usual Saturday night sirens around Croydon. Slept like a log though. Lovely breakfast at Elly’s Cafe down the road – great grub and a lovely friendly welcome. In the morning we headed back to Abinger as the churchwarden had said he would open it up for us. It is currently undergoing extensive renovation so was quite bare. 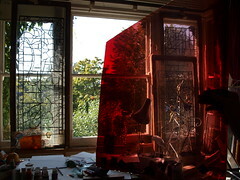 Lawrence Lee’s window was the only stained glass in the place – and was rather wonderful. An abstract cross across three panels (I will learn the proper terminology when I get home, but for now you will have to make do with my clumsy descriptions). We met up with Pippa and David again – they were on their way to a local birthday party. Pippa said that there was a very French feel to this window and that LSL said the trouble with Victorians was that everything had to be symmetrical, but that left no margin for error. He advised her to avoid symmetry. 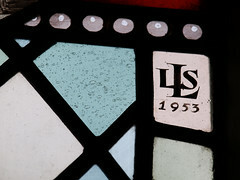 She also said that LSL’s windows were never monotonous because he used such small pieces of glass. It’s a shame we couldn’t have had her with us for the whole journey – her insights are interesting and I wanted to learn more. We left them to their party and headed to Holy Trinity, Bramley. This was a very Victorian looking church with lots of gold and many many stained glass windows. LSL’s window was quite traditional, as many of his earlier pieces are. As he became more known and sought after, it seems he was given a freer hand in the design and interpretations. 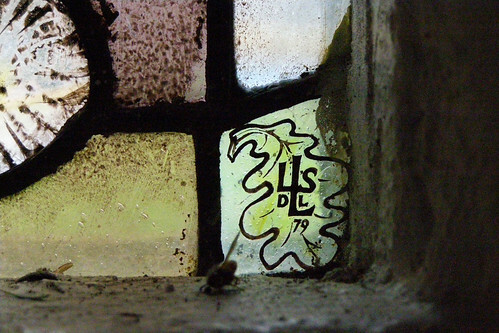 Although this was a solo window, it is worth mentioning that LSL was unusual in that he always included the name or initials of his assistant within his signature. Stephen remembered a lot of them as we discovered their names as we went along. We have found a few online in the past but will be making contact for this project soon. Next was Dunsfold. The church was set quite a way away from any houses and we discussed that some villages were moved away from the churches during The Plague and set up a little further away. This church was wonderful – a fabulous old yew tree in the grounds and fascinating old wood and roof tiles to keep me happy taking photographs outside for ages. There is so much to say about this church and I couldn’t do it justice off the top of my head, so I’ll fill in those details on the Flickr photos when I upload them. It is worth noting here that Stephen’s preferred reading method is to remove his glasses and press his nose against the page. He emerges every so often with a gem of information. The glasses are useful for scratching his head. We then headed off to Bisley and a lovely little church, also set away from the village. This time, apparently, it was because it had been a Pilgrim’s Church – erected for travelling monks and other pilgrims. 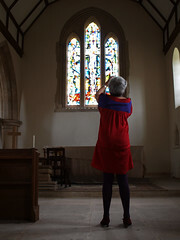 We were let into the church by the church warden who hastily removed a notice board from in front of LSL’s very vivid window (see bottom) and swept away the cobwebs for me too. Our last church for the day was St Lawrence in Chobham. There we met the Rev Andrew Body who was most informative about the church building and very interested in our project. The pews each have a different carving on the end, and each one tells a story. The pulpit was carved by teenagers – in the 1800s – and the church also boasts very rare ‘elbow supports’. Again, I will need to learn more about this to be able to describe it fully, so watch this space if you are interested. At the end of a long and very productive day we decided that takeaway pizza back at the B&B was the best plan and I was able to sit and compose the blog for the previous day. Successful tired is definitely a different and better tired than the usual kind. The first day of the adventure. 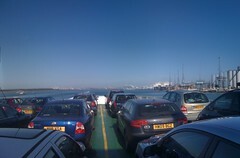 My friend Stephen and I got an early ferry to Southampton (the Portsmouth ferries were fully booked because of Bestival) and headed off to Surrey. The weekend plans were to try to photograph his father’s stained glass windows in the area – as many as possible. 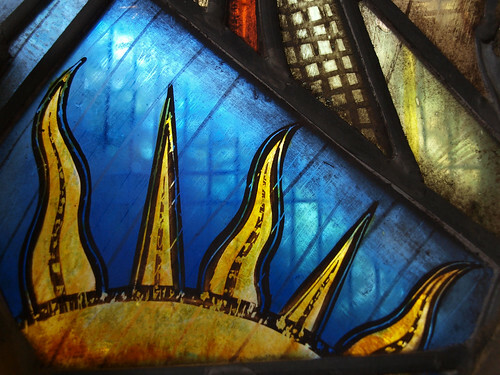 Stephen’s father is Lawrence Stanley Lee (LSL), a master stained glass artist who will be 100 years old next week! We had a list of 21 places to visit, though we didn’t expect to be able to get to them all. A few emails had been sent prior to leaving and I’d had a few replies, but we still weren’t sure exactly where we would be going. We had, however been invited to lunch by Pippa – LSL’s last assistant. 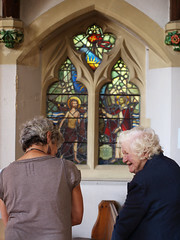 She met us at St Luke’s Church in Reigate where we were let into the church by a lovely local lady, Brenda, who had lived in the town all her life and remembered the windows being installed in 1954. Pippa is currently restoring one of the large windows in this church and I was able to get some close-up photos for her before we went to her home nearby for lunch in the garden. LSL was a little unusual in that he always added his assistant’s name or initials to his signature on the windows. 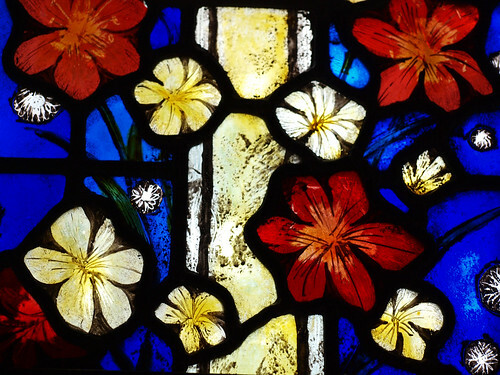 On this window was the name C R Wallis – an assistant who went on to become one of Canada’s leading stained glass artists. At Pippa’s we saw some of her own work – she has a magnificent stained glass piece in her front door and another on the landing of her beautiful house which is full of visual joys. We were also treated to a visit to her glass studio upstairs. What a place! I could have spent hours there just photographing everything. The three of us headed off to Abinger to see if the church there was open. I hadn’t received a reply to my email but both Stephen and Pippa were keen to give it a try. Unfortunately the church was locked and when we phoned the warden he said that he would be able to open it the next day for us. I took a lot of photos in the grounds though, and the light was lovely. The horse chestnut trees were dripping with ripe conkers ready to drop to the ground and I was surprised by this. 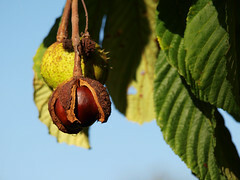 When I was a child, and even in much more recent times, my experience of ‘conker trees’ has been that you can’t get any because other kids have been there before you and nabbed them all. To think that there would be any hanging from the branches was amazing. “In my day” they would have been knocked out of the tree before being fully ripe, by thrown stones or sticks. Perhaps kids these days are at home, not allowed out, or glued to their computers. Perhaps the game of conkers is no longer considered fun. Well I have these twin beauties in my handbag now – do I bake them in the oven on low and slow, or shall I soak them in vinegar? I can’t remember which was best. After Abinger we took Pippa home and had a cuppa before heading off to the B&B to check in and, although very tired, walk into town for something to eat. We went to a Himalayan Nepalese Indian [sic] restaurant – wonderful lemon rice and a Thai curry (yes, I know – I wonder where these guys were actually from). A successful day – very very tired though as I didn’t get much sleep the night before. Out like a light, and lots planned for the next day.